"We have two measures of time, one annual which the sun bounds by its circuit, the other monthly which the moon embraces as it circles." 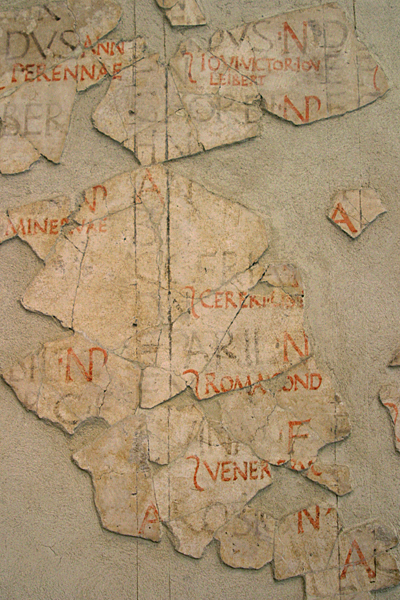 The calendar of Republican Rome is represented by the fragmented Fasti Antiates Maiores. In the reconstruction above, the abbreviated names of the months are arranged across the top, preceded by the letter K (Kalends, the first day of the month). The Non (Nones) is indicated as the fifth day, and the Eidus (Ides) as the thirteenth. At the bottom are the total number of days in each month. (The intercalatory month of Intercalaris, which was included every other year, is represented by the thirteenth column.) The days themselves are listed vertically beneath each month and represented by a recurring cycle of letters A through H, every ninth day, counting inclusively, being identified as a market day, nundinae, which was painted in red (hence, a "red-letter day"). Besides these nundinal letters, the day had an additional letter (notae dierum) denoting its status: fasti (F), days on which civil and legal business could be conducted; nefasti (N), in which these activities were prohibited; and comitiales (C), when public assemblies (comitia) could convene and vote. Other letter designations identified days about which less is known. EN (endotercisi) identified those that were divided between the morning and evening, which were nefastus, and the afternoon, which was fastus. NP probably abbreviated nefastus publicus and designated public holidays. Large letters mark important state festivals and smaller letters, brief notations, such as the name of a divinity or ludi to note games held in honor of the gods. There also were days, although not identified as such in the calendar, in which activity either was restricted in some way or avoided altogether as unlucky (dies atri), or—if following the Kalends, Nones, and Ides (dies postriduani)—inauspicious for any new undertaking (Varro, On the Latin Language, VI.29). Augustus, for example, "also had regard to certain days, refusing ever to begin a journey on the day after a market day, or to take up any important business on the Nones" (Suetonius, Life of Augustus, XCII). In this detail from the Fasti Antiates, one can see the festivals for the latter part of April. Painted directly on the fresh plaster in red and black on a white background, the fresco was found at the site of Nero's villa at Antium (Anzio). It is the oldest version of the fasti (indeed, only one other painted calendar exists) and a unique example of the lunar calendar of Numa Pompilus, which was followed until the solar calendar was instituted by Julius Caesar in 46 BC. Here, in red, one can see the celebration of the Cerialia (Cereri Libero) in honor of Ceres, the goddess of grain (April 19) and the Vinalia Priora (Veneri Erucinae) in celebration of Venus (April 23), when wine from the previous year's vintage could be sold. Between the two festivals there is the anniversary of Rome itself (Roma condita) on April 21, when the city traditionally was thought to have been founded in 753 BC. The only other historical date on the calendar is July 18 (Dies Alliensis), when Rome was defeated at the river Allia and its legions nearly destroyed by the Gauls in 390 BC (Varro, On the Latin Language, VI.32). 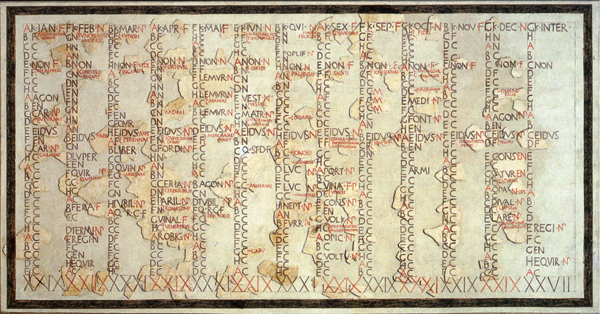 The Fasti Antiates is the only Roman calendar to date from the Republic. All others are from the time of Augustus and Tiberius, except for two later codex calendars from the fourth and fifth centuries AD. Altogether, more than forty calendars survive, some almost complete, others only in fragments. The largest is the Fasti Praenestini, which measured approximately six by eighteen feet. Among the dies nefasti were counted the dies feriae (holy days or holidays), a word which, although plural in form (like Kalendae and Nonae), applied to a single day and comprised both private celebrations, such as birthdays and days of mourning, as well as religious festivals, such as the Lupercalia or Saturnalia. These public holidays included annual festivals, for which the dates were fixed; movable feasts, which were determined every year by the pontiffs; and days proclaimed in times of national crisis or to celebrate a great victory. The days on which feriae were celebrated were dies festi. Religious rites were performed and lawsuits prohibited, and there was an opportunity for rest, even for slaves. Although not holidays, themselves, ludi or public games also were celebrated then. Listing the dies fasti and dies nefasti when legal business could or could not be conducted, the calendar was jealously guarded by the pontiffs. Indeed, it was not publicly displayed until 304 BC, when Gnaeus Flavius had a calendar erected in the Forum. The first son of a freedman to be elected aedile, he also published the forms of legal procedure (legis actiones), thereby marking the transition from an oral to a written legal system. Traditionally, the calendar for the month was announced by the pontiff at the first quarter of the moon. In time, it must have been easier to declare these monthly proclamations in writing and, eventually, to record them as a complete calendar. In his Roman Questions (XXV), Plutarch asks "Why do they reckon the day that follows the Kalends, the Nones, or the Ides as unsuitable for leaving home or for travel?" "Is it, as most authorities think and as Livy records, that on the day after the Ides of Quintilis, which they now call July, the military tribunes led out the army, and were vanquished in battle by the Gauls at the river Allia and lost the City? But when the day after the Ides had come to be regarded as ill-omened, did superstition, as is its wont, extend the custom further, and involve in the same circumspection the day after the Nones and the day after the Kalends? And speaking generally, time is a sort of number; and the beginning of number is divine, for it is the monad. But after it is the dyad, antagonistic to the beginning number, and the first of the even numbers. The even numbers are imperfect, incomplete, and indeterminate, just as the odd numbers are determinate, completing, and perfect. Wherefore, in like manner, the Nones succeed the Kalends at an interval of five days and the Ides succeed the Nones at an interval of nine days. For the odd numbers define the beginnings but even numbers, since they occur after the beginnings, have no position nor power; therefore on these days they do not begin any business or travel. Since, therefore, all travel and all business of importance needs provision and preparation, and since in ancient days the Romans, at the time of festivals, made no provision or plan for anything, save only that they were engaged in the service of their gods and busied themselves with this only, just as even to this day the priests cause such a proclamation to be made in advance as they proceed on their way to sacrifice; so it was only natural that they did not set out on a journey immediately after their festivals, nor did they transact any business, for they were unprepared; but that day they always spent at home making their plans and preparations. Or is it even as men now, who have offered their prayers and oblations, are wont to tarry and sit a while in the temples, and so they would not let busy days succeed holy days immediately, but made some pause and breathing-space between, since business brings with it much that is distasteful and undesired?" Reference: Palazzo Massimo Alle Terme (1998) edited by Adriano La Regina, from which the picture of the reconstructed calendar has been taken. The detail is from the Fasti Antiates in the Palazzo Massimo alle Terme (Rome).